Wow, that was a manic comeback by the number one overall seeded Louisville Cardinals to eek out a victory over the spirited Wichita State Shockers 72-68. My nerves were shot after that game. Louisville came out flat from the tip, a product of spending the last week in a swirl of emotional ups and downs associated with helping their friend and teammate Kevin Ware deal with his shattered leg that occurred in the Regional Final against Duke the previous weekend. Wichita played brutal defense, clamping down on the interior spacing, causing Gorgui Dieng or Wayne Blackshear to be held scoreless. To be honest Peyton Siva couldn’t hit the broadside of the barn all night. Part of that was defense and part was he missed wide open shots. Russ Smith did what he does best – keep his engine chugging. He couldn’t buy a basket early, and over-penetrated resulting in turnovers, but kept after it to pour in 21 points, on 6-17 shooting. Smith kept the Cardinals in this game to give them a chance, but it was Louisville’s second team that was responsible for this victory. Wichita State controlled the tempo throughout the game, slowing down the pace, limiting Louisville’s possessions and keeping them from getting any transition momentum. Louisville ran its press, and it did cause Wichita trouble getting up the court, but this is a veteran club, and they made good decisions, only giving up 11 turnovers. Where Louisville’s defense particularly paid dividends was it harassed West Regional MVP Malcolm Armstead into 1-10 shooting and only 2 points. Wichita State stretched its lead to 12, as Louisville got itself into foul trouble, and things starting looking pretty dark when the reserves rose up. The thing with Louisville is they always believe they are going to win. Foul trouble doesn’t bother them nor does a deficit. Luke Handcock was playing a smart game, but his long-range shots were not falling enough, so he took it upon himself to drive to the hole and find ways to score points closer around the basket. He took his game up a notch to fight through the tall trees and dropped in 20 points. But really, the hero of this game was walk on, Tim Henderson, a 6-2 junior, who splashed two 3-pointers only seconds apart, which slashed the lead from 12 to six. Those were huge shots, because Louisville hadn’t been able to find any traction up to that point to cut into Wichita’s lead. Also contributing was junior forward Stephen Van Treese, not with points, but blockouts and a couple key rebounds and tip outs. Montrezl Harrell again played well and contributed eight big points, including one huge tip in. And starter Chane Behanan dropped in 10. This was the epitome of a team victory. This game was ripe to be lost. It’s almost a shame that Wichita lost, but they couldn’t quite hold Louisville off. Cleanthony Early had a monster game for the Shockers, scoring 24 points and pulling down 10 rebounds. I’m not sure how many more stars can align for Louisville. They outscored Syracuse 40 to 10 in the Big East championship game to come from behind, Kevin Ware snapped his leg and they won, they come back in the national semi-final using reserves and a walk-on, apparently Pitino is going to be elected to the NCAA College Basketball Hall of Fame Monday, Pitino’s race horse won the Santa Anita Derby yesterday to advance to the Kentucky Derby, and his son was hired by Minnesota for a head coaching position. The Louisville Cardinals have some serious momentum going their way. Now they face the No. 4 Michigan Wolverines, with Trey Burke, the consensus NCAA player of year, along with three other kids who are children of NBA players and emerging star center Mitch McGary. 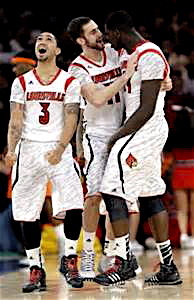 This will be Louisville’s biggest test, but they are forged in the fire of victory. I don’t know if the Cards can pull off one more win, but I sure wouldn’t bet against them. This entry was posted in Events, News, Travel, Uncategorized. Bookmark the permalink.